A test production run at the IPT Fraunhofer with 300 shafts of 16 mm diameter and 50 mm length shows the high reproducibility of the hard turning process with the Hembrug Mikroturn series. 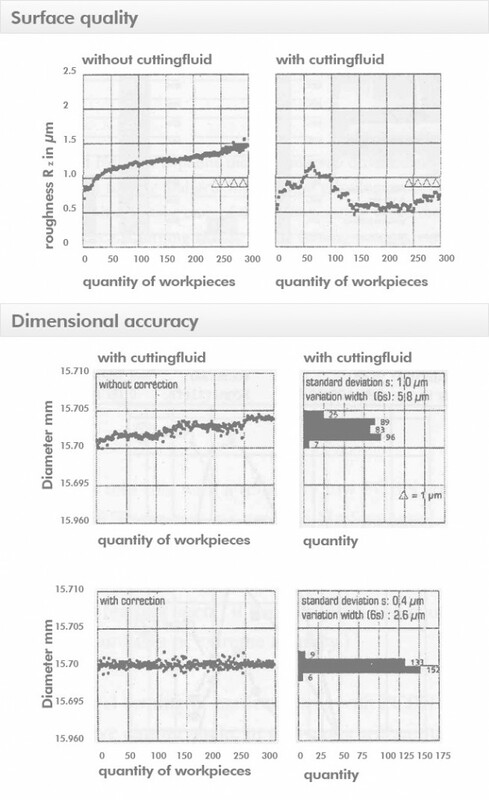 Machining without correction gives a standard deviation of 1 μm for the error in diameter. Correcting the x-slide movement through product measurement during machining means that the standard deviation not even exceeds 0,6 μm. Peak-to-valley roughness RZ is always lower than 1.5 μm. First products of the series have a roughness even better than 1 μm. The results for a series of 300 high-precision hard turned shafts. The diagrams proof the high reproducibility and accuracy of the hard turning process on a hembrug machine. Examples for the application of high-precision hard turning with Hembrug machines can be found in the automotive industry (fuel injectors, gears), ball-bearing industry (raceways), hydraulics and pneumatics (valves), and moulds (preHB forms for PET bottles). In those cases ISO-standard qualities up to IT 3 are attainable. IT 3 means a tolerance field of 3 μm for diameters from 10 to 18 mm. It amounts to only 2 μm for diameters from 1 to 3 mm. Such small tolerances bring about a one-sided machining error that is considerably smaller than 1.5, respectively 1.0 μm. This error accumulates from different sources: cutting tool wear, slide straightness deviation, main spindle run-out, thermal effects and mechanical vibrations. And it should be borne in mind that diamond turning of non-ferrous materials gives even higher ISO-qualities!